This article is about the action management system by David Allen. For other uses, see Getting Things Done (disambiguation). The GTD method rests on the idea of moving planned tasks and projects out of the mind by recording them externally and then breaking them into actionable work items. This allows one to focus attention on taking action on tasks, instead of recalling them. First published in 2001, a revised edition of the book was released in 2015 to reflect the changes in information technology during the preceding decade. The update incorporates recent scientific research supporting the system's claims regarding how the mind functions. Logic tree diagram illustrating the second and third steps (process/clarify and organize) of the five-step Getting Things Done workflow. Because hardware and software is changing so rapidly, GTD is deliberately technologically-neutral. (In fact, Allen advises people to start with a paper-based system.) Many task management tools claim to implement GTD methodology and Allen maintains a list of some technology that has been adopted in or designed for GTD. Some are designated "GTD Enabled", meaning Allen was involved in the design. Unlike some theories, which focus on top-down goal-setting, GTD works in the opposite direction. Allen argues that it is often difficult for individuals to focus on big picture goals if they cannot sufficiently control the day-to-day tasks that they frequently must face. :54 By developing and using the trusted system that deals with day-to-day inputs, an individual can free up mental space to begin moving up to the next level. Allen recommends scheduling a weekly review, reflecting on the different levels. The perspective gained from these reviews should drive one's priorities at the project level. :50 Priorities at the project level in turn determine the priority of the individual tasks and commitments gathered during the workflow process. During a weekly review, determine the context for the tasks and put each task on its appropriate list. An example of grouping together similar tasks would be making a list of outstanding telephone calls, or the tasks/errands to perform while out shopping. Context lists can be defined by the set of tools available or by the presence of individuals or groups for whom one has items to discuss or present. GTD is based on storing, tracking, and retrieving the information related to the things that need to get done. Mental blocks we encounter are caused by insufficient 'front-end' planning. This means thinking in advance, generating a series of actions which can later be undertaken without further planning. The mind's "reminder system" is inefficient and seldom reminds us of what we need to do at the time and place when we can do it. Consequently, the "next actions" stored by context in the "trusted system" act as an external support which ensures that we are presented with the right reminders at the right time. As GTD relies on external reminders, it can be seen as an application of the theories of distributed cognition or the extended mind. In 2005, Wired called GTD "A new cult for the info age", describing the enthusiasm for this method among information technology and knowledge workers as a kind of cult following. Allen's ideas have also been popularized through the Howard Stern Show (Stern referenced it daily throughout 2012's summer) and the Internet, especially via blogs such as 43 Folders, Lifehacker, and The Simple Dollar. In 2005, Ben Hammersley interviewed David Allen for The Guardian article titled "Meet the man who can bring order to your universe", saying: "For me, as with the hundreds of thousands around the world who press the book into their friends' hands with fire in their eyes, Allen's ideas are nothing short of life-changing". In 2007, Time Magazine called Getting Things Done the self-help business book of its time. In 2007, Wired ran another article about GTD and Allen, quoting him as saying "the workings of an automatic transmission are more complicated than a manual transmission... to simplify a complex event, you need a complex system". A paper in the journal Long Range Planning by Francis Heylighen and Clément Vidal of the Free University of Brussels showed "recent insights in psychology and cognitive science support and extend GTD's recommendations". ^ a b c d e f g h i j k l m n o p q r Allen, David (2015). Getting Things Done: The Art of Stress-Free Productivity (2 ed.). Penguin Books. ISBN 9780143126560. ^ Fallows, James (November 2012). "Busy and Busier". The Atlantic. Retrieved December 28, 2018. ^ David Allen (2001). "Getting Things Done: Five Simple Steps That Apply Order To Chaos". gettingthingsdone.com. Retrieved 2015-01-04. ^ Forrister, Kelly (2010-08-02). "Which list manager should I use for GTD?". GTD Times. The David Allen Company. Archived from the original on 2010-08-06. Retrieved 2015-01-04. ^ Forrister, Kelly (2009-05-04). "Simply GTD with Kelly: Getting Started". The David Allen Company. Archived from the original on 2010-08-29. Retrieved 2010-08-22. If you're at all familiar with GTD you know that David Allen does not tell you which tools to use--GTD is tool agnostic--so those choices are up to you. Not saying all tools, software programs, paper planners work seamlessly with GTD, but where you organize your stuff is up to you. ^ "Common Tools & Software". Getting Things Done website. David Allen Co. Retrieved 2014-05-30. ^ a b Heylighen, Francis; Vidal, Clément (December 2008). "Getting Things Done: The Science behind Stress-Free Productivity" (PDF). Long Range Planning: International Journal of Strategic Management. 41 (6): 585–605. CiteSeerX 10.1.1.161.441. doi:10.1016/j.lrp.2008.09.004. ISSN 0024-6301. ^ Andrews, Robert (2005-07-12). "A new cult for the info age". Wired.com. Condé Nast. Retrieved 2010-03-05. ^ Mann, Merlin (2004-09-08). "Getting started with "Getting Things Done"". 43 Folders. Retrieved 2010-03-05. ^ Robinson, Keith (2006-03-21). "Best of GTD". Lifehacker. Retrieved 2010-03-05. ^ "Review: Getting Things Done". The Simple Dollar. 2007-05-06. Retrieved 2010-03-05. ^ Hammersley, Ben (2005-09-28). "Meet the man who can bring order to your universe". The Guardian. London: Guardian News and Media Limited. Retrieved 2010-03-05. ^ "The Oracle of Organization". Time. 2007-03-12. Retrieved 2010-03-05. ^ Wolf, Gary (2007-09-25). "Getting Things Done Guru David Allen and His Cult of Hyperefficiency". Wired.com. Retrieved 2010-03-05. Allen, David (2001). 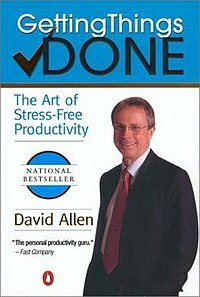 Getting Things Done: The Art of Stress-Free Productivity (1 ed.). Penguin Books. ISBN 978-0-14-200028-1. Allen, David (2003). Ready for Anything: 52 Productivity Principles for Work and Life. Viking Books. ISBN 978-0-670-03250-1. This page was last edited on 10 March 2019, at 00:16 (UTC).